The name Chatterer has been used by ornithologists in a very wide sense, and often irrespective of its meaning or of the nature of the birds to which the name has been applied. Gesner's name for the WAXWING, Garrulus Bohemicus (i.e. 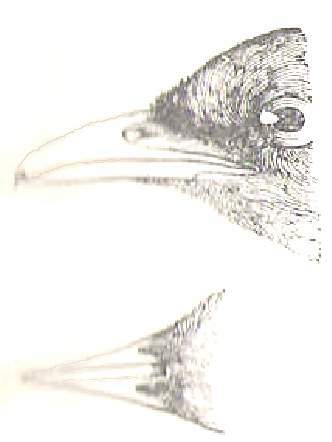 Bohemian Jay), having been erroneously rendered by Ray, in his translation of Willughby's Ornithology (p. 133), "Bohemian Chatterer"; and that bird being also the Ampelis of Aldrovandus, subsequent writers, Pennant and Latham, used "Chatterer" as the equivalent of Ampelis, when Linnaeus had founded a genus with that name, quite regardless of its inapplicability. The genus Ampelis, being very composite in its character was naturally broken up at a later stage in history, and was temporarily used in its original sense for the Waxwing and its congeners. However, the Waxwing today form the genus Bombycilla within the family Bombycillidae - the genus Ampelis no longer exists in today's 21st Century classification of birds. The name chatterer has also been generally conferred, for want of a better, on a group of birds, one of the most beautiful of which Brisson had termed Cotinga. This group, all the members of which inhabit the Neotropical Region, is a very natural one, and has long been regarded as a separate Family, properly called Cotingidae, though it is closely allied to the Pipridae (MANAKIN) family (together these two families the old division HETEROMERI of the MESOMYODI of Garrod and Forbes). A considerable number of these birds are remarkable for the extraordinarily abnornal form of some of their wing-quills, and occasionally of their wing-coverts - a feature in the former case observable also among the Pipridae, and, where existing, generally confined to the male bird. Many of them also are brilliantly coloured, and at least one, today known as the the Pompagour Cotinga (Xipholena punicea) but known as the Pompadour Chatterer in the 19th Century (and had a latin name of Xipholena pompadora at that time) was given its 19th Century name by Edwards (Gleanings, ii. p. 275, pl. 341) after the celebrated Madame de Pompadour, to whom it and other birds were being sent, when the ship that bore them from Cayenne fell a prize to a British cruiser. The Pompadour Cotinga is of a hue scarcely to be seen in any other bird.